Pitlochry is a great little town. Tucked amongst hills and forest, it is another one of these crenellated gingerbread house Victorian towns that look they were created just to be photographed. We stayed at Bruach Mhor guesthouse. It's a very good bed and breakfast and if you are interested in geology and paleontology the hosts are fantastic people to talk to. Our plan for the day was to drive from Pitlochry to Glencoe. But we had to make a few stops on the way. The first stop was the Croftmoraig Standing Stones. This is a really impressive site located on an unassuming farm and on an even more unassuming road (A827 to Kenmore). In fact, the standing stones stand in a field that is used to graze sheep. It's well worth a stop. The circle at Croftmoraig was excavated in 1965. Excavations showed three phases of construction: About 5000 years ago, a horseshoe arrangement of fourteen wooden posts was erected in an ellipse 7 m by 8 m. This was surrounded by a ditch. Later, the posts were replaced by eight stones of graded height. Another smaller stone stood just outside this ring. A stone bank was built outside the stone circle and cup-marked stones added that aligned with the southern moonset and the midsummer sunrise. The third stage of construction consisted of the placement of a 12 m diameter circle of twelve large stones, in a addition to two outlying boulders that mark the entrance to the ESE, near to which are two burials. 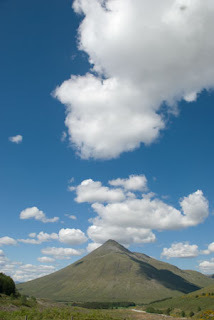 Two other items of interest about Croftmoraig: In Gaelic Croftmoraig translates to Field of Mary. 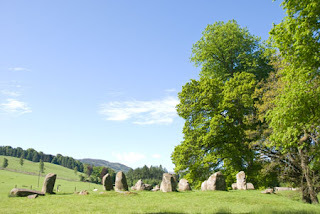 Also, modern day practitioners of "the craft" theorize that Croftmoraig appears to be on an energy ley line alignment with the 'Praying Hands of Mary' a megalithic standing stone, situated 15 miles away, in Glenlyon. This Traveler has to point out that the Standing Stones predate the establishment of Christianity and thus these are not the original names of said structures, but having said that, I don't discount that there may be some relationship between the two sets of stones. A crannog is is a type of ancient lake (or loch) dwelling found in the British Isles, some of which date as far back as 5000 years. Crannogs tend to be circular structures built as individual homes accommodating extended families. 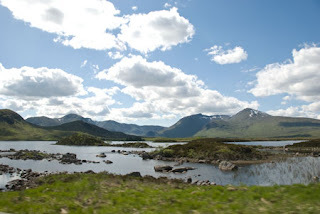 Crannogs were built, modified, and reused in Scotland up through the 17th century. 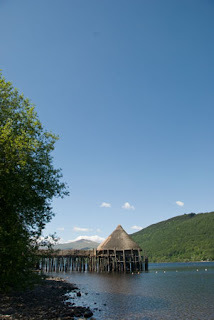 The crannog pictured here is a reconstruction of the Oakwood crannog, also found on Loch Tay, which dates to some 2500 years ago. It is one of only a few crannogs that have actually been excavated (by underwater archaeologists of course!). It is a shame that more funding and more work hasn't gone into investigating the crannogs and the culture that created them. 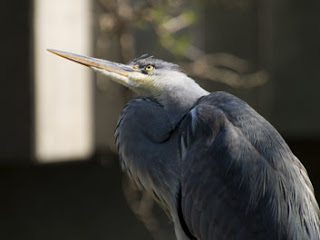 It is a fascinating part of human history and we know virtually nothing about it. Inside the crannog itself it is very cozy and neat. The bracken covered floor is very soft and cushy. People would have slept above the central hearth area on raised platforms. 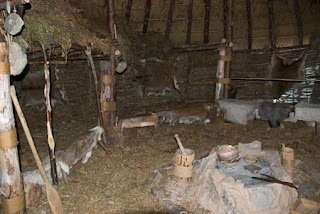 The primary couple would probably have slept above the animals for warmth (lucky them). Based on materials excavated, any metal or stoneware items would have been precious (not a whole lot has been found). 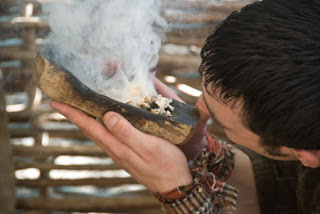 The people living in the crannogs would have had animals such as cows, sheep, and pigs, as well as practiced agriculture, hunting and gathering. All evidence points to these people being very good at exploiting their environment. They were also master weavers and could, with their hand looms, do a twill weave very similar to that used in jeans today. One ever present danger would have been fire, mostly from the family hearth. A thatched roof is an fire hazard. There are no smoke holes in the tops of crannogs because of the threat of sparks being drawn up through it and setting the roof ablaze. Tests show that smoke easily dissipates through the thatch and the areas where walls meet the roof. 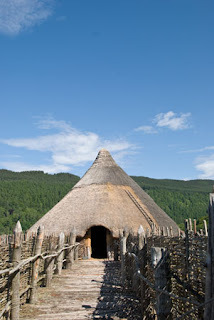 Thus the crannog was probably a fairly nice place to live. 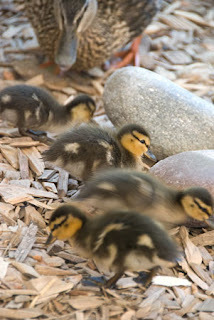 Baby Mallards interrupting the demonstration on how to drill a hole in a rock using a bow, a stick, some rope, and some sand. 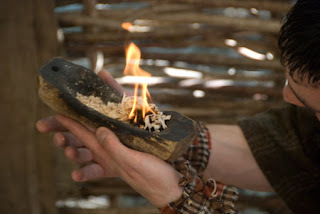 The Crannog Centre also provides the opportunity to try out some of the technologies the people in the crannogs used. There were several hand- or foot-power driven lathes to play with, as well as a bow drawn hole driller. 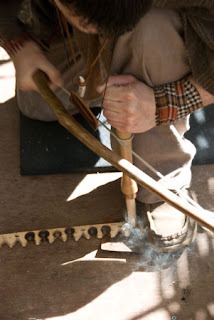 Both Traveler Two and I tried these as well as trying our hand at making wool thread, grinding grain, and making fire. We succeeded splendidly at all but making fire. We failed to make fire. We tried and tried but failed anyway. Having taken the ember created in the first stage and added it to wood shavings, things begin to smolder. Our guide did not fail to make fire. Driving to Glencoe was a long, winding, and rather scary because of the speed one had to use to go with traffic while trying to stay on the road through the hairpin turns.